You've found the “West Virginia Nigerian Dwarf Goat Breeders” page here at Hobby Farm Wisdom! If this is the first time you have visited our site: Welcome! 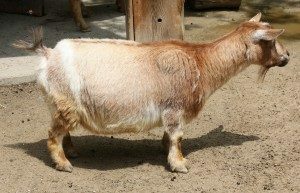 The Nigerian Dwarf is a miniature goat of West African Origin. The male’s height ranges from 19 to 23.5 inches and the females 17 to 22.5 inches. Dwarf goats come in many colors. Main color families are black, chocolate and gold. Random white markings are common, as are spots and other color combinations such as red, white, gold and black. New born kids average about 2 lbs at birth but grow quickly. They reach sexual maturity at a young age, some have been known to breed and be fertile as young as 7 weeks of age. Even though they are small, the Nigerian Dwarf does give a surprising quantity of milk. Their production ranges from 1 to 8 pounds of milk per day. Can’t find the right Nigerian Dwarf Goat in West Virginia? Check in: Ohio, Pennsylvania, Virginia, Maryland, or Kentucky. Or, to see a list of ALL the Nigerian Dwarf Goat breeders in the US: Click Here!